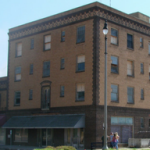 Wewoka Lofts is a scattered site development in Wewoka, Oklahoma, and will consist of the historic rehabilitation of the former Aldridge Hotel and the new construction of single-family homes generally located near Third Street and Brown Avenue. The Project will provide 32, one, two, three, and four-bedroom units contained in the historic Aldridge Hotel and 16 new single-family homes. All units will be restricted to those earning 60% or less of the area median income, with 16 of the 32 units further restricted to households at or below 50% AMI. The Project was made possible by both Low Income Housing Tax Credit and Historic Tax Credit financing, and is expected to be completed by the end of 2018.